Engineering tests of earthbag structures have begun, mostly at the university level. The understanding of earthbag construction is improving as engineers are laying the groundwork for understanding the physics of these flexible walls with multiple contact planes between varying size rounded bags and soil fill. They have already established that soil in bags can have greater strength than soil alone, and that barbed wire and plaster layers contribute significantly to preventing wall failure. It is important to note that bags of sand are not earthbags. Standard 14"-15" thick earthbag walls made with fill containing clay that is well tamped and dried, create stronger structures. Adobe, which incorporates clay has been a standard building material for millenia and earthbag is a technology that is also primarily based on the strength of the clay that acts as a binder. Additional testing in the future can explore the difference between solid poly bags and tubes, and the strengths of walls created with HDPE raschel mesh and other plastic meshes. But currently, the most pressing need is to develop correct dimensional and reinforcement recommendations for the strongest types of bag walls (of solid poly) in hazardous locations. Engineers have been trying to evaluate earthbag strength since 1998. Research of civil engineering ‘soil bags’ using loose fills influenced research of ‘contained sand’ types of earthbag with loose fill. 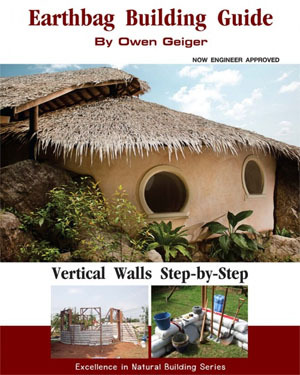 For these unusual earthbag walls the fabric strength determines compressive strength, and meshed plaster delays wall failure. Normal 360- 380 mm (14"-15") thick earthbag walls of damp clay fill have had less testing. Adobe soil, which incorporates clay, has been a standard building material for millennia. Earthbag is also based on the strength of damp cured clay that binds to prongs on barbed wire and/ or inserted rebar. Stronger soil fill makes stronger walls, not limited by fabric strength. Strong earth in tubes or bags with barbed wire is less brittle than most other earth construction types, surviving earthquake motion better than most earth building types. Earthbag builders can volunteer to help create test walls by contacting Kelly at kellyhartATgreenhomebuilding.com to post contact information and approximate dates on this website. The commentary on the tests below by Patti Stouter was last updated on July 10, 2017. For more recent research, see Wikipedia ‘Contained Earth’ or email PStouterATbuildsimple.org. 2006 Dunbar & Wipplinger (West Point): Prism Testing of PP Earthbags Full scale; Uncured dry soil, sand and rubble; 11 samples; Compression of 3-bag stacks. 2008, Daigle (Queens U): Earthbag Housing: Structural Behavior > Full-size; Cured loamy sand soils and gravel; 26 samples; Compression of 3-, 6-, and 9-bag stacks. 2009 Pelly (Bath U): Plastic Limit Analysis of Earthbag Structures 60% scale; Sand fill and sand fill with 4%; cement; 5 samples; Compression of 8-bag stack without, of 3- and 5-bag stacks with barbed wire. 60% scale; Sand fill; 18 samples. Shear of 2-bag stacks with or without barbed wire under varied weights. 2010 Stouter: Friction and Tensile Strength of Earthbag Components ; 80% scale; Cured clay loam and sandy clay loams; 28 samples. Tilt table/ static friction tests of 2-bag stacks with barbed wire and/ or pins. Pullout of barbed wire from 3 samples with cured, partly cured and uncured loam. 2010 Vadgama (Bath U): Material and Structural Analysis of Earthbag Housing. 70% scale; Sand and cured sand with 4% cement; 14 samples. Compression of 3-, 5-, and 8-bag stacks with varied fabric and barbed wire. Shear of three 2-bag stacks. 2011 Liu et al (Advanced Materials Research) Cyclic Simple Shear Tests on Base Isolation Using Soilbags Full-size Medium and coarse sand and uncured silty clay loam; 6 samples. Shear and damping of 4-bag stacks under varied weights. 2012 Connoly Jin Malik (Dartmouth): Earthbag Walls 80% scale;Cured cohesive loam; 1 sample. Compressive strength and modulus of elasticity for stacked bags. 2015 Salas (Barcelona Tech): Estudio del comportamiento estructural de construcciones de tierra. 60% scale; Cured medium loam, loam with 10% cement; 12 samples. Compression of eight 2-bag stacks with or without barbed wire. Shear of four 2-bag stacks with or without barbed wire. 2010 Vadgama (Bath U): A Material and Structural Analysis of Earthbag Housing. The behavior of earthbags under uniaxial compression, the effect of material fill level, stack height, addition of stabilizer and bag material on the compressive strength were explored. 2011 Croft (Bath U Engineers without Borders): Structural Resistance of Earthbag Housing 6 versions of 3’- 6” (1.07 m) ht. x 3’-7” (1.1 m) walls tested for shear and for flexure, barbed wire and rebar tensile strength, cement stucco with chicken wire flexure and compression tests; Materials: Small solid poly bags form 23 cm (9”) thick walls; sand fill or sand with 5% cement; barbed wire, vertical rebar, and cement stucco with chicken wire alternates. 2011 Si Hong Liu, et al (Advanced Materials Research) Cyclic Simple Shear Tests on Base Isolation Using Soilbags Soilbags have been understood to have the effect of vibration reduction and can be used as a kind of base isolation in building foundations. In this paper, a series of cyclic simple shear tests were carried out on soilbags filled with three kinds of soils under different vertical stresses to investigate the damping and stiffness characters of the soilbags. The results show that soilbags have a relatively high damping ratio and variable horizontal stiffness so that they can be used as base isolation materials. 2013 Awais Malik Structural Analysis of Earthbag Systems First Earthbag Shake Table Tests Create a Computer Model. Awais Malik dedicated 6 weeks to sew small bags, twist custom barbed wire, and plaster the corners of 1/6 scale models of 3 kinds of corners. Despite difficulties with outputs he was able to use the results of the shake test to create a computer simulation accurate to within 1.5%. Engineers use computer programs that simulate the violent stresses earthquakes cause to buildings, to learn without destruction. Mr. Malik's testing showed that 2 narrow corner buttresses or one massive thickened corner pier reduce earthbag wall motion under vibration by 26% and 33% respectively. Structural Information for Earthbag is a detailed description and evaluation of testing done on earthbag assemblies over several years by both educational institutions and Patti Stouter, the author. 2013 Malik (Dartmouth College): Structural Analysis of Earthbag Systems. 1:6 scale Cured cohesive soil with plaster 3 samples. Shake tests, computer modeling of corners with and without buttress or pier. 2013 Ross et al (U Florida): Wind Load Test of Earthbag Wall Full scale; Partly cured silty sand soil; 1 sample. Out-of-plane displacement of 7.6 m² (82 s.f.) unplastered, braced wall. 60% scale; Cured strong and weak sandy loam; 4 samples; Shear of 1 m² (11 s.f.) earth plastered, varied soil compressive strength and interior or exterior rebar reinforcement. 2009 Pelly (Bath U): Plastic Limit Analysis of Earthbag Structures 60% scale; Sand fill and sand fill with 4% cement 5 samples; Compression of earthbag arched stacks on 2.2 m (7’-3”) span with and without barbed wire. 2011 Croft (Bath U): Structural Resistance of Earthbag Housing 60% scale; Sand fill or sand with 5% cement; 12 samples; Shear of 1.2 m² (12 s.f.) with varied rebar, barbed wire and one stuccoed. Flexure of 13-bag stacks with varied barbed wire and one stuccoed. 2011 Thiart (Peninsula U of Technology) Stability of the Sandbag Wall System to Horizontal Load 86% scale Sand fill with partly cured interior channel of loam; 1 sample. Flexure of unreinforced c-shaped wall 3.6 m (12’) long with concrete ring beam and earthen plaster. 1998 Khalili & Vottore: Earth Architecture and Ceramics: The Sandbag/Superadobe/ Superblock Construction System An article outlining the chronology and results of testing done on Nader Khalili's superadobe system of building. Simulated static and dynamic load tests of domes and vaults. Some of the buildings survived twice the loading required for this currently 1.4 g spectral acceleration risk area. No test report available. 2010, Pakistan Straw Bale and Appropriate Building (PAKSBAB) Seismic Performance of Innovative Straw Bale Wall Systems The objective of this research project was to determine the capacity of clay plastered, load bearing, straw bale wall assemblies under in-plane cyclic loading, and the performance of a small full-scale straw bale house using shake table simulation. The straw bales were resting on a soil cement encased gravel bag foundation. 2011 Nijs & Schiettecatte (U Ghent): De bouwfysische…/ The construction and physical performance of earthbag dome houses in different climatic zones. (Dutch) Thermal evaluation of 4 m interior dome of cohesive earth and earthen plaster in 6 different climates with mitigating measures. 2015 Zhao, Lu, Jiang (South China U of Tech.) 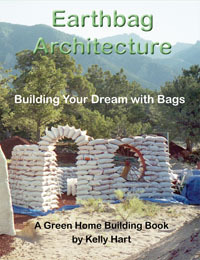 An Energy Efficient Building System Using Superadobe Summer ventilation and thermal performance of a small dome. 2016 Cataldo-Born, Letelier, Pabon (Catholic U of Peru) Obstacles and motivations for earthbag social housing in Chile Life cycle energy, CO2, and costs of stabilized dome vs. reinforced brick rectangle house. 2016 Canadell, Blanco, Cavalero (Catalunya Poly) Comprehensive design method for earthbag and superadobe structures Structural design for domes based on research on sand fills. Larger paper online in Spanish includes some thermal studies: Estudio estructural de domos realizados con la técnica de falsa cúpula y superadobe. 2003 Hart: An Amazing Experiment If anyone had any doubts about the strength and integrity of this system of building, this experiment should help allay those concerns. Earthbag building of this sort can be STRONG! 2011 Nijs & Schiettecatte (U Ghent): De bouwfysische…/ The construction and physical performance of earthbag dome houses in different climatic zones. Thermal evaluation of 4 m interior dome of earth fill with clay and earthen plaster in 6 different climates with mitigating measures; used Capsol 4.0 software. Available online early July, 2011. Understanding of the strengths and limitations of earthbag is deepening, as is the difference between earthbag and now-accepted construction like adobe. Earthbag builders want to see appropriate performance-based standards develop for earthbag buildings of different types like those sited below that have been developed for adobe, CEB, and rammed earth. Stouter (Build Simple Inc.): Structural Information for EarthbagDescription and discussion of all research to date of contained earth, contained sand, contained gravel. 2008 Xu et al: Earth reinforcement using soilbags. Geotextiles and Geomembranes, 26 (3), pp.279-289. 2003 D. M Ogoli: Predicting indoor temperatures in closed buildings with high thermal mass. Energy and Buildings, 35(9):851–862, 2003, ISSN 0378-7788. The above list of earthbag testing includes links to many public domain reports. If you are doing structural research in earthbag construction and would like to be in touch with authors of the papers that are not public domain, email Owen Geiger (strawhousesATyahoo.com) or Patti Stouter (simple_earthATyahoo.com) and ask them to forward your email to the author in question.